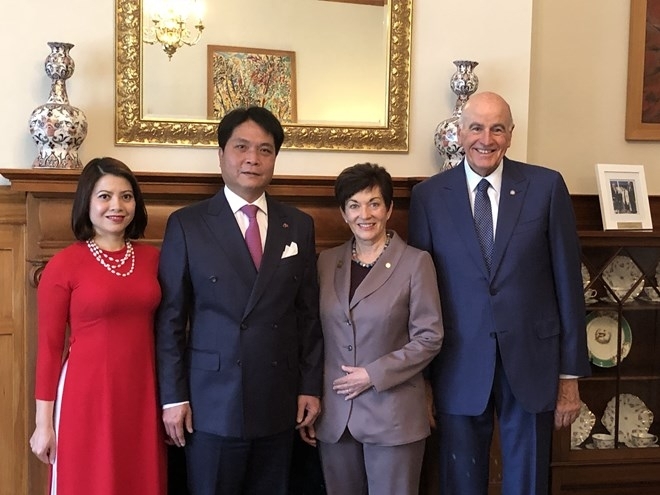 Governor-General of New Zealand Patsy Reddy has pledged to support the enhancement of the friendship and multifaceted cooperation with Vietnam, especially in sustainable development. At a recent reception for outgoing Vietnamese Ambassador to New Zealand Nguyen Viet Dung, the Governor-General expressed her delight at the strong development of the two countries’ comprehensive partnership. She praised the ambassador’s contributions to consolidating and strengthening bilateral ties in a wide range of areas, especially politics-diplomacy, economy-trade, education-training, agriculture, tourism and health care. She said she admires the achievements Vietnam has made in economic development over the past time. For his part, Dung said that Vietnam and New Zealand have maintained the regular exchange of delegations at all levels and are implementing the action program for 2017-2020. The two countries have seen a strong growth of bilateral trade in recent years, with a record rise of 30 percent to 1.6 billion NZD (US$1.2 billion) last year. These will help develop the bilateral cooperation in an intensive and practical manner, creating a premise for the upgrading of the relations to a strategic partnership in the time to come, he said. On the occasion, the ambassador conveyed President Tran Dai Quang’s invitation to the Governor-General to visit Vietnam in an appropriate time. Earlier, Dung came to say goodbye to New Zealand Deputy Prime Minister and Foreign Minister Winston Peters.